The Foley Sports Tourism Complex is a well-planned success. The facilities are a type of hybrid ballpark that offers a little something for everyone. The property features 16 state-of-the-art, multi-purpose fields and a 90,000 sq. ft indoor events center. The property is also home to shopping, dining, amusement rides, hotels and medical care, all on-site. The goal for the Foley Sports Tourism Complex is to be a "one stop shop" for all of the sporting needs of visitors and residents of the Gulf Coast. The fields are perfect for a variety of sports and the championship field has a press box, 1,000 seats and TV lighting for broadcast coverage. These natural grass fields are maintained in an area well-known for it's success in the grass business and actually turfed the field for Superbowl XLIX. The Alabama Gulf Coast is an ideal venue for hosting year-round events with mild temperatures and convenient location. Sports requiring indoor facilities, like basketball, volleyball, cheer leading, dance, gymnastics etc.., will enjoy the spacious 90,000 sq. ft. indoor facility. Foley will also be able to accommodate banquets, concerts, trade shows, conventions etc... The new state-of-the-art facility is a great, useful addition to the Foley area and is sure to promote Foley and the Alabama Gulf Coast as an ideal venue for a variety of sporting events with everything needed for top competition. 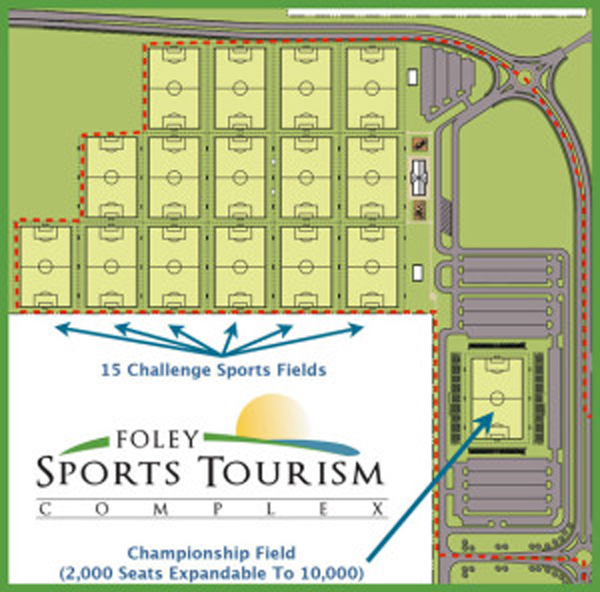 The Foley Sports Tourism Complex is a host of things grouped together to form a hybrid amusement park / sportsplex. Plans for the end result call for a destination comfortable hosting large events with National implications. The area has already host several NCAA sanctioned National Championship events, most recently, the NCAA Beach Volleyball National Championship. The Foley Sports Tourism Complex is located in the heart of Foley and close to several area attractions, like the Tanger Outlet Mall and bowling alley.